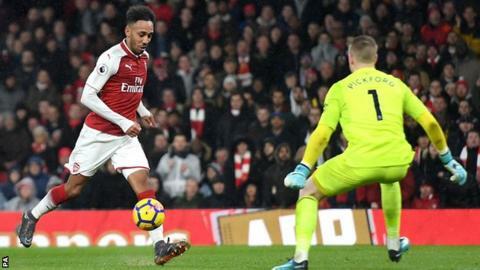 Pierre-Emerick Aubameyang started his Arsenal career with a goal, Jamie Vardy opened the scoring yet again, Bournemouth extended their unbeaten run, Burnley continued their winless streak and Sam Allardyce reached a managerial landmark. Burnley have gone nine Premier League games without a victory (drew five, lost four); their longest winless run since November 2014 (10 games). Manchester City have scored in 25 of their 26 Premier League games this season; only one side has scored in each of their first 26 (Arsenal in 2001-02 on their way to netting in all 38 matches). Bournemouth are unbeaten in seven Premier League games (won four, drew three); their longest-ever run without a loss in the competition. Xherdan Shaqiri's opening goal for Stoke was his first-ever headed goal in Europe's big-five leagues in his 139th appearance (24 goals in total). Brighton registered their first win in their last seven Premier League games (drew three, lost three), with their three-goal haul as many as they managed in their previous six top-flight games combined. West Ham's Javier Hernandez netted his 43rd Premier League goal, all of which have come from inside the box. Only Tim Cahill has scored more with 100% of them coming from inside the box (56). Leicester's Jamie Vardy has scored the opening goal in six different Premier League games this season; no player has done so more often (same as Sergio Aguero and Harry Kane). Ki Sung-yueng - who provided the assist for Swansea's leveller - made his 155th Premier League appearance, overtaking Park Ji-Sung as the South Korean with the most appearances in the competition. Manchester United's Alexis Sanchez has had a hand in nine goals in his last 10 Premier League games against newly-promoted sides (eight goals, one assist). Huddersfield failed to score for the 10th time in Premier League away games this season; more than any other side. West Brom have picked up just one win from their last 24 Premier League games (drew 11, lost 12). Southampton's Mario Lemina, who scored his first ever Premier League goal, is the third player from Gabon to score a goal in the competition after Daniel Cousin and Didier Ndong. Pierre-Emerick Aubameyang is the eighth player to score on his first Premier League appearance for Arsenal. Everton manager Sam Allardyce has now managed 500 matches in the Premier League, making him just the fifth manager to reach this milestone. Arsene Wenger won his 500th match in charge, Harry Redknapp drew, and Alex Ferguson and David Moyes both lost.